Goalkeeper Marty Gallagher’s sixth clean-sheet in row helped Institute defeat a battling Armagh City side. 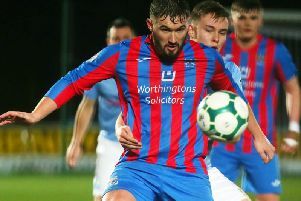 Gallagher, who had to make a great save to deny Stefan Lavery from giving his side the lead just after half-time, wants his and the teams current run of form to continue. The 25-year-old was speaking to Kevin McLaughlin after their hard fought win at Drumahoe.